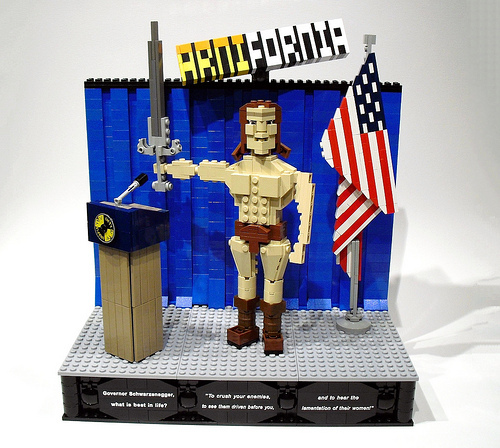 Iain Heath of The Living Brick presents “ARNIFORNIA!” — Arnold Schwarzenegger stands tall as both Conan the Barbarian and the Governor of California. Conan also shares words to live by. Asked “What is best in life?” he replies, “To crush your enemies, to see them driven before you, and to hear the lamentation of their women.” Indeed. In addition to the inherent humor of the scene, Iain incorporates several nice techniques, starting with the furled flag. The sword includes a pair of space control panels as the guard, and Arnold wears boots made from barrels. That sword is pretty wicked. Come to BRICKS BY THE BAY, this April 9th through 11th, at the Marriott hotel in Fremont, CA. Be there, or feel the cold steel of Conan’s blade! And the codpiece, don’t forget all the work Iain put into the codpiece.